Is there a requirement for the distance strong back purlins can be from each one? The state I’m in is Nebraska. Residential home in rural NE. Not quite sure what you are asking? Are you speaking of a series of purlins along a run of rafters with a break between the purlins? Are you talking about parallel sets of purlins spaced for very long rafter runs? Can you provide a little more detail? The amount of purlins that brace up from the load bearing to the strong back. Say there are strong backs that run the entire length of the roof and then there are purlins off the strong back down to load bearing every 8 foot. Would that be something that needs corrected? Sorry to be vague. Looks like I replied the wrong way, see other post. Thanks for your help! The purlins run horizontal and the purlin struts or bracing run vertical down to the load bearing framing. First off the purlin is the horizontal member that is actually contacting the rafters. Strongbacks come in many forms and uses so it is best just to refer to a purlin as a purlin. Purlins are then supported by a “brace” that is run from purlin to a load bearing component (wall or beam) below it. If I understand your question correctly you are asking about the spacing of the braces. Braces should be spaced no more than 4’ on center (OC). They do not have to be at the very end of the purlin but that is typical. Also braces should not be less than a 45 Degree angle from the horizontal framing below. Braces that are in excess of 8’ long must also be braced themselves typically by “T”'ing a piece of wood to it. That bracing helps prevent them from flexing. So in your case 8’ OC braces are incorrect and should be called out. However the Inspector should also look to see if the incorrect placement is causing any issues and report either way. Since we do not know the intention of the original roof framing design, we don’t typically know the exact species of wood used for the rafters, unless the rafter spans are obviously extremely long then the purlins might not have originally been needed and may only have placed there by a conscientious framer who likes to make sure nothing would happen in the future. Ill post a picture of what I see. That will probably help. Again much appreciated! Here is what the current bracing looks like. The vertical braces appear to be excessively/improperly spaced at over 4’ OC. Unless we know the species of wood for the rafters, the horizontal distance from the top plate of the wall below the attic and the ridge board where the rafter spans from/to, and the load factor for the roof we would not be able to determine if those purlins were necessary or not. It is not easy to see here but the purlin (horizontal support) should be the same dimension as the rafters they support and these do not appear to be. The vertical braces are improperly routed down to a strongbacked brace (also called a Rat Run in this case) used to stabilize the ceiling joists. These are not intended to support purlin vertical braces and this also appears incorrect. Having said all that from what you are displaying there does not appear to be any ill effects from this condition. However whether this could withstand time or not would be left to the decision of a licensed Engineer or a very good framer. Again we have not much to go on to determine if the purlins were even needed. As Emmanuel said, you would need to know the species, dimension and span of the rafters to know if purlins are necessary. 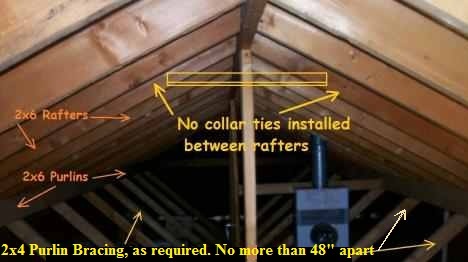 The only member that I see in that attic that would be suitable for transferring the roof load to using purlins is the center beam. This would leave you with long struts that need stiffeners. you would also need to watch the strut angle. The purlin is usually installed so that the flat edge of the purlin matches the angle and lays flat against the struts, rather than square to the rafters unless the struts themselves are square to the rafters, which wouldn’t be the case here (it’s difficult to properly secure the purlin to the strut if the angles are different). If that is a new build, I would refer to the AHJ for clarification. Whether the system is sufficiently supported and structurally sound is not a call I would make, unless I could see signs of deflection or stress. Its a new build the width of the home is 40 feet, I’m not sure the span. I’m not actually an inspector but a consultant for a construction company that has framer with 35 years of experience and is one of the last people around the area that still utilizes conventional framing as everyone seems to be moving to trusses. The framer claims he has not failed an inspection when done by a city or state inspector (were in Nebraska) upon further investigation he has not failed any sort of framing inspection or had any call backs or issues with homes he’s built in the past and that number is climbing towards 525 homes. The reason I’m posting in here is because he’s being sued for “shoddy” and “uncommon” work. According to the Framer the span of the 2x6 rafters were 22 foot, this is the only section of the roof in question. Unfortunately anybody can sue anyone else for anything these days. With what you have posted so far I would be curious about several things. Has the framer called in a licensed Structural Engineer to review his work and make an engineering determination as to its condition/method? If so what has the licensed Engineer stated? Not trying to beat up on you but you have piqued mine, and possibly others’, curiosity. What type of consulting do you perform for the construction company? Your posts make it appear that the framer is working on one of your construction jobs and is being sued for his work. Is that correct? If so I fully expect the construction company has also been named as a defendant. If so what actions has your company taken to defend itself and one of its sub-contractors? With regard to your span dimension post has the framer explained why they chose to use purlins or was this an engineered design that he is following? Unfortunately the homeowner had a contractor that has been in business for 2 years make the determination. He was hired the fix the defects before our company was notified that there was any. So we had 0 chance or opportunity to have an engineer take a look. We would have fixed or repaired any defects for free that’s our policy. No engineer has been consulted. No. but every 4 feet is typical. Strongback the same as rafters, so if the rafters are 2x10 the strongback should be 2x10. Undsersize is not a defect on older houses unless you see failure. Braces should rest on a bearing wall, typically a hallway wall. Brace angle should not exceed 45 degrees. “Purlin” is the name of the assembly. The strongback is the horizontal member and should be nailed to the braces with a block nailed to each brace below the strong back. Purlin systems are specified by architects. In a house that had been there for a while I wouldn’t call braces on 8’ centers a defect unless I saw evidence of failure. For a long time there were no regulations, just best practice, which can vary by area.